The Internet allows ignorance to blossom as it has for the 9/11 Truth movement. To the naive their arguments can seem compelling but when you actually analyze their claims with hard science and facts, they completely fall apart. I was not only trained in computer information systems but also architecture. This is why absolutely nothing about any of the building collapses looked suspicious to me. I have nothing but contempt for the "truthers" who push propaganda on the naive. Their claims are just ignorant: "the WTC fires were not hot enough to melt steel" (they didn't have to be, just hot enough to weaken it's load bearing ability); "WTC 7 fell at free fall speed" (it didn't - it fell 40% slower); "WTC 7 was a controlled demolition" (zero evidence to support this); "Aircraft hitting buildings should leave a cartoon cutout" (hollow aluminum aircraft hitting high-strength, load-bearing perimeter steel columns will leave no such shape) and on and on. I literally laughed out loud the first time I saw "Loose Change" and that idiot Dylan Avery claimed pressure releases from the weight of the WTC towers collapsing on themselves were a controlled demolition. Only someone absolutely ignorant of structural design and engineering would believe these ridiculous claims. Unfortunately this appears to be a significant number of people which compelled me to write this. I give the utmost praise to those fighting this insanity and the cult like movement that is "9/11 Truth". Without their hard work knocking down one conspiratorial claim after the next this whole situation could be much worse. What I have done here is compile a simple reference debunking the 9/11 Conspiracy Theories. Please share the real truth. - Addendum to "Why Did the World Trade Center Collapse?—Simple Analysis"
- Closure of "Why Did the World Trade Center Collapse?—Simple Analysis"
- Closure of "Mechanics of Progressive Collapse: Learning from World Trade Center and Building Demolitions"
- Closure of "What Did and Did Not Cause Collapse of World Trade Center Twin Towers in New York?" "There is a distinct difference between having an open mind and having a hole in your head from which your brain leaks out." "Their claims are just ignorant: "the WTC fires were not hot enough to melt steel"
It was initially the defenders of the government's story who claimed that the fires melted the steel. Even as late as 2006, Lee Hamilton 9/11 Co-Chair, claimed that the jet-fuel fires melted the steel. Since this delusion is still widespread it us up to the 9/11 Truth Movement to correct it. NIST, in their Final Report, now admits that WTC7 fell at free-fall acceleration for 2.25 seconds. This was something that they initially denied and something that their computer model(i.e cartoon animation) did not allow for. "Aircraft hitting buildings should leave a cartoon cutout"
Is this a common claim amongst the 9/11 Truth Movement or something that you just made up? "Only someone absolutely ignorant of structural design and engineering would believe these ridiculous claims." Exactly, people who believe that explosive charges can blow stuff up are CRAZY! Actually no it was the 911 Truth movement who repeatedly tried to state that fire cannot melt steel when no structual engineer talking about the the towers collapsing ever made this claim. I notice you provide no sources for your claims. The only place online I found regarding Lee Hamilton making these comments is post by you. Not to mention Lee Hamilton is an attorney and not a structural engineer. Leaving out the full context of their statement is disingenous and dishonest. The cartoon cutout claim I frequently ran into with no-planers (planes did not hit the towers). No claim was made that explosives cannot blow stuff up only that their is no evidence of a controlled demolition. Hyman Brown, "This building would have stood had a plane or a force caused by a plane smashed into it. But steel melts, and 90,850 litres of aviation fluid melted the steel. Nothing is designed or will be designed to withstand that fire." Chris Wise "The columns would have melted, the floors would have melted and eventually they would have collapsed one on top of each other." John Knapton: "The 35 tonnes of aviation fuel will have melted the steel... all that can be done is to place fire resistant material around the steel and delay the collapse by keeping the steel cool for longer." Eduardo Kausel: "I believe that the intense heat softened or melted the structural elements--floor trusses and columns--so that they became like chewing gum, and that was enough to trigger the collapse." Lee Hamilton: "What caused the collapse of the buildings, to summarize it, was that the super-heated jet fuel melted the steel super-structure of these buildings and caused their collapse." Since this is a popular delusion that some people share, including the 9/11 Co-Chair Lee Hamilton, it is necessary, in some circumstances, for the 9/11 Truth Movement to correct it. NIST, in their draft report, initially denied that WTC7 entered free-fall for any period of time. It was through the work of David Chandler that NIST was obligated to correct their inaccurate assumptions. How is free-fall for even 2.25 seconds(105 feet - 8 stories) possible when there are thousands of tons of steel in concrete in the way? It isn't. NIST has yet to deal with the implications of free-fall. Demolition, is the only known mechanism, that would have allowed for a free-fall drop. Nothing can explain the destruction of WTC1,2 or 7 except for engineered demolitions. All the evidence points in that direction. You need to provide official sources of these. All three are comments are made right after the attacks, in some cases just days. I found no repeat of these comments later on which suggests to me they were implying a weakening of the steel or were not aware of the actual heat the fires reached when their comments were made. Eduardo Kausel - I could find no source for the quote. Hamilton in the interview admits he is not an expert. The only people that share this delusion is the 911 Truth movement as they are the only ones I hear repeating this claim. In a multi-stage collapse free-fall for a limited time is very possible. 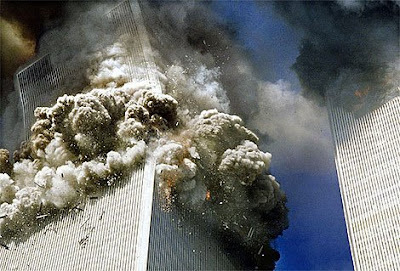 Of course something can explain the towers collapsing, two 767's loaded with aviation fuel hitting both towers, structurally damaging the perimeter and interior columns, exploding, which removed the spray on fire protection, the aviation fuel then flash started office combustibles, heating up and weakening the load bearing ability of the steel floor truss structure to failure. The loss of the floor trusses weakened the load bearing ability of exterior columns which eventually resulted in a catastrophic failure of the entire structure. It helps if you actually understand the design of the WTC. I will add an additional video just on this from NOVA. I would appreciate it if you actually watch the videos here and not just post comments that are answered in them. I'm not sure what your problem is with the 9/11 Truth Movement correcting people who state the jet-fuel fires melted the steel. Yes, Lee Hamilton is not an expert, but he still seemed to believe that the fires melted the steel. In a conversation, it would be entirely appropriate to point out to him that this was not the case. Michelle Malkin: "I believe Trig was born to Sarah Palin. I believe Barack Obama was born in Hawaii. I believe fire can melt steel and that bin Laden’s jihadi crew — not Bush and Cheney — perpetrated mass murder on 9/11. What kind of kooky conspiracist does that make me?" You write, "The only people that share this delusion is the 911 Truth movement as they are the only ones I hear repeating this claim." You write, "In a multi-stage collapse free-fall for a limited time is very possible." The stages of collapse by NIST are somewhat arbitrary. How is a free-fall collapse possible for 8 stories? Demolition is the only known mechanism that could have done this. Do you know of another way that can be verified experimentally? You write, "The loss of the floor trusses weakened the load bearing ability of exterior columns which eventually resulted in a catastrophic failure of the entire structure." I'm not sure what explanation you are trying to offer here. The current official explanation for "collapse initiation" is the inward bowing of the perimeter columns due to catenary action of the sagging floor trusses. The original NOVA documentary promoted the now discredited pancake collapse hypothesis. This explanation was discarded by NIST some time ago. Official sources only not 911 Truther sites. But you are not correcting people. You are using it to make people think that is the official argument so they will doubt it. You fail to let people know the timing of these comments and act like everyone is saying these things. It is getting old. The delusion about melting steel being the official or widespread belief of collapse outside of the 911 truth movement. When a floor drops away from the rest of the structure it is temporarily in free fall until it hits something else. In a multi-stage collapse this is very possible. All of this is answered in the NIST reports. Gee, its unfortunate you guys should come out with this considering how credible and helpful your information on global warming and peak oil is. The 911 truth movement's goal is a new independent investigation into what happened on the events of 911. Many of the family members of victims have unanswered questions about the events of that day. An investigation was not started until a year later and then only reluctantly and then only with a tiny budget. There has been peer-reviewed research that say explosives were used. Almost a thousand architects and engineers are demanding a re-investigation. Hundreds of pilots say the official story is not possible. How do you explain the molten metal described by the fire-fighters as being like in a foundry? I really don't see how (or why) you would want to sweep this under the carpet. Given that thousands of people are sceptical and there are so many unanswered questions about the most significant event in US history, don't you think there should at least be a proper investigation??? Do you not support an inquiry that fully and scientifically investigates the facts? I am sorry but what I have seen is a lot of pseudo-science and the repetition of myths. That is fine if the family members have questions and they want another investigation. But what I have found is that they are not looking for answers but what they want to be the answer. The 911 commission report was a report to answer how and why it happened and after reading it, I feel it did a very good job of that. But it was not an engineering report. The ones done by the NIST have been very thorough and have attempted to answer all of the engineering relating questions. Most of the people arguing about this have not read either report let alone both. The Peer review paper in question has some serious issues. All four samples were originally collected by private citizens who lived in New York City at the time of the tragedy." "The study, however, shows that the dust was collected from four different sites, three of which were not in the immediate area surrounding the fallen towers. Most of the samples are collections of dust taken from blocks away." This a major problem, there was no scientific procedure followed for collection of the samples, you do not have scientists or officials who deal with investigations performing the collection of dust but average citizens and it was allegedly collected from blocks away. This makes the whole paper suspect and I have a hard time believing any of the conclusions. There are not a thousand architects and engineers arguing for this. There has been one - Richard Gage an architect. The NIST answers questions regarding molten steel. "NIST investigators and experts from the American Society of Civil Engineers (ASCE) and the Structural Engineers Association of New York (SEONY)—who inspected the WTC steel at the WTC site and the salvage yards—found no evidence that would support the melting of steel in a jet-fuel ignited fire in the towers prior to collapse. The condition of the steel in the wreckage of the WTC towers (i.e., whether it was in a molten state or not) was irrelevant to the investigation of the collapse since it does not provide any conclusive information on the condition of the steel when the WTC towers were standing. NIST considered the damage to the steel structure and its fireproofing caused by the aircraft impact and the subsequent fires when the buildings were still standing since that damage was responsible for initiating the collapse of the WTC towers. Under certain circumstances it is conceivable for some of the steel in the wreckage to have melted after the buildings collapsed. Any molten steel in the wreckage was more likely due to the high temperature resulting from long exposure to combustion within the pile than to short exposure to fires or explosions while the buildings were standing." You keep claiming a proper investigation was not done but the NIST has done a thorough investigation which people who keep arguing this have never read. I am as skeptical as the next person but I have found no evidence to support the claims made by the 911 truth movement. After looking into the thermite paper, I find it to be a joke. They find evidence of elemental aluminum and iron oxide and then conclude that it is super thermite. Really? So nothing else could have those compounds in them? Actually there is. All those materials in that paper would be found in the materials used for the WTC. The same material was found in the primer paint used on the steel which is 36% iron oxide. If you contact the paint companies they will give you the ingredients. There is a reason those red chips look like paint chips, because they are. I've just been watching 911 conspiracy files by BBC, that's a great document I've never heard of and that hasn't been played in France my country, maybe because medias are afraid that they could spread the myth instead of debunking it. "NIST, in their draft report, initially denied that WTC7 entered free-fall for any period of time. It was through the work of David Chandler that NIST was obligated to correct their inaccurate assumptions." Really? Where in the NIST draft report did they say free fall did not occur? Had you actually read it you would have seen that they were measuring the overall collapse in comparison with full free fall. Chandler brought up a question about free fall , so the y elaborated on the stage by stage progression. Some conspiracy theorists are puzzled about why the WTC towers fell at almost free-fall speed on Sept. 11, 2001. They suppose that the speed of collapse is evidence that something or someone must have destroyed the structural integrity of the undamaged lower part of each tower. After all, they reason, "only the upper floors of the building were damaged, so why did the lower floors collapse, and why did they fall so fast?"